But now the very thing that Valkyrie fights for is in danger, as a ruthless killer snatches her little sister in order to lure Valkyrie into a final confrontation. With Skulduggery racing to catch up and young sorcerer Omen scrambling along behind, Valkyrie only has twelve hours to find Alice before it's too late. As the helmsman of the wildly-successful Skulduggery Pleasant series, Derek Landy exchanged a life as a sometime writer of screenplays to, almost overnight, becoming one of the world’s biggest names in children’s fiction. 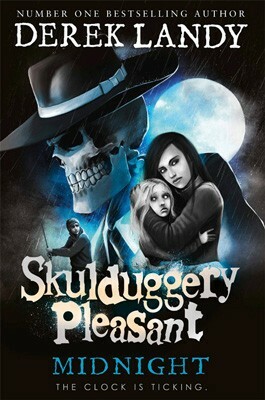 Debuting in 2007, Skulduggery Pleasant took its readers on a wild ride to the undead, where the niece of a famous horror writer suddenly discovers that what he was writing wasn’t so fictional after all. In 2015, Landy briefly stepped away from his Skulduggery duties to pen a fresh trilogy for young adults, Demon Road, and as something of a Whovian, contributed a tale to the Doctor Who collection 12 Doctors 12 Stories. There's one word in particular that springs to mind after my reading of Derek Landy's Midnight: disjointed.